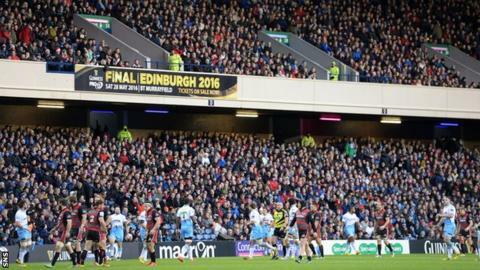 A maximum of 8,000 people will be allowed through the gates at Murrayfield for the second leg of the 1872 Cup between Glasgow and Edinburgh. Scottish Rugby says the decision was taken to limit the capacity due to a shortage of available safety staff. The match was switched from Scotstoun due to a waterlogged pitch. Scottish Rugby said: "The option to sell significantly more tickets for this match has not been possible due to safety and security reasons." Murrayfield has a capacity of 67,800, but Scottish Rugby insists it was not possible to make more tickets available. "The safety and well-being of all supporters is paramount and, given the late venue change and the time of year, it was simply not possible to get the appropriate external support staff in place to ensure the well-being of a larger crowd," a statement on the Scottish Rugby website added. Edinburgh hold a 23-11 lead from the first-leg, which was also held at Murrayfield, with both games doubling as Pro12 fixtures.